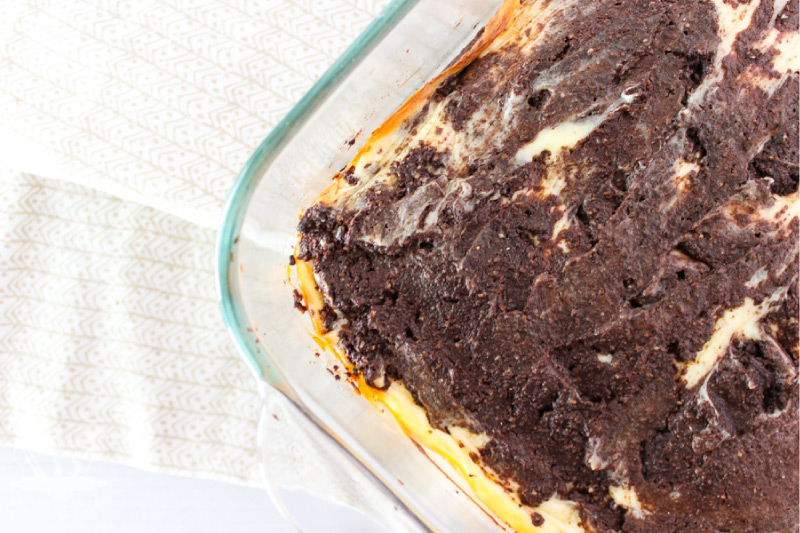 If you are looking for a great sugar free, low-carb alternative to traditional cream cheese brownies, you’ve found it in these chewy, chocolate, keto cream cheese brownies. Curb your chocolate cravings without the guilt and still stick to your low-carb or ketogenic diet. I have made these keto cream cheese brownies several times now. If you have been a reader for any length of time, you know that I love to bake. I would take baking over cooking, crafting, and even DIY any day. So when I started this thing called the Ketogenic Diet, I thought my baking days were over. Well, luckily for me (and you!) they aren’t over but rather they take a little bit more trial and error. I’ve already learned how typical flours, leavening agents, and sugar behaves in traditional baking, but now I am learning a whole new way to bake. See, sugar alcohols like Erythritol and Xylitol** behave differently in recipes than sugar does. It took me making these keto cream cheese brownies a few times to learn that Erythritol needs time to soak in to a liquid. I’ve also learned that coconut flour absorbs liquid like you wouldn’t believe! That’s why it’s best to add it in to a recipe in small increments rather than at once. A recipe also takes much less of it than it would of regular all-purpose flour. All of these tips I’ve learned slowly from trial and error, but I know I have so much more to learn when it comes to keto baking. 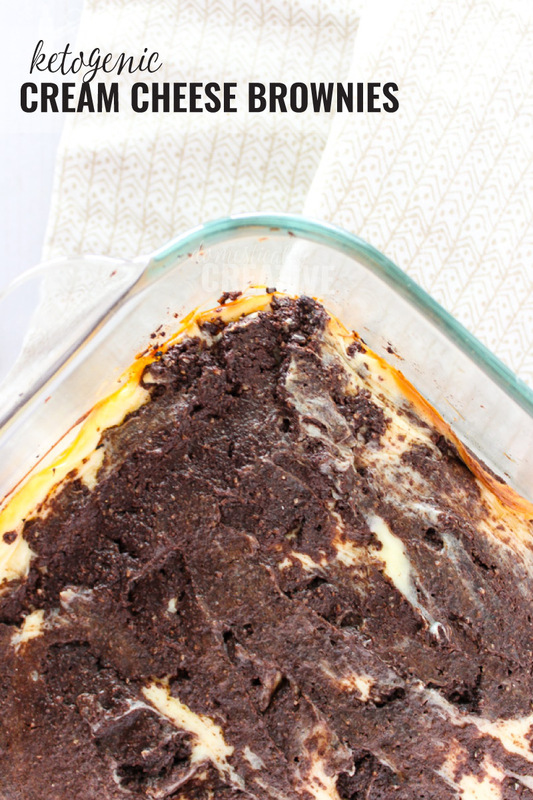 But in the meantime, we can all enjoy these delicious keto cream cheese brownies! ***UPDATED January 2019*** I have since discovered that I prefer baking with Swerve sweeteners. Not only is the taste the best I’ve found, but it comes in 3 forms–granulated, brown, and powdered. Powdered Swerve is great for frostings or for no bake desserts. 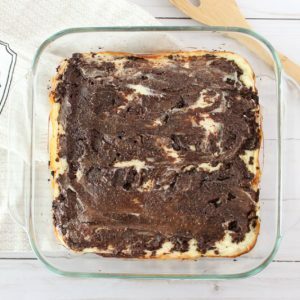 The Brown sugar Swerve is awesome in some chocolate chip cookies, and granulated Swerve is fine in a recipe like these keto cream cheese brownies! **I just want to add that if you use Xylitol in your household, please please PLEASE be sure that it is out of reach of your four legged friends. 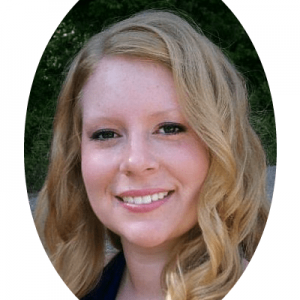 Let me go into a little bit of detail about how Xylitol affects our pets. For us, it’s a great sugar substitute and most people actually prefer the taste of it to Erythritol. For our pets though, if they ingest any Xylitol, even in a small amount, it can be fatal. Their bodies react to Xylitol like they would to sugar, secreting insulin to lower their blood sugar levels. The problem is though, that Xylitol doesn’t raise their blood sugar levels. So in fact, the body is producing insulin and lowering their blood sugar level, sending them into hypoglycemia. Hypoglycemia is deadly if not treated immediately. The scary part is that Xylitol is in our sugar free gum (which is easy for a pet to find on the ground) and even some peanut butters. So please please be very careful with using this around your pets and never give your pet something that has Xylitol in it. Definitely make the cream cheese layer first as once the brownie batter is made it will quickly stiffen up. The coconut flour absorbs moisture super fast. If you make the brownie batter first, by the time the cream cheese batter is made the brownie batter will be too thick to “swirl” or marble. If you want to really get that marbled cheesecake brownie look, add a little bit of heavy cream ~2tbsp to the top brownie batter portion right before layering it on top. This will help with marbling. As with any keto dessert, these do have a different texture than traditional brownies made with all purpose flour. This is due to the egg, coconut flour and erythritol. 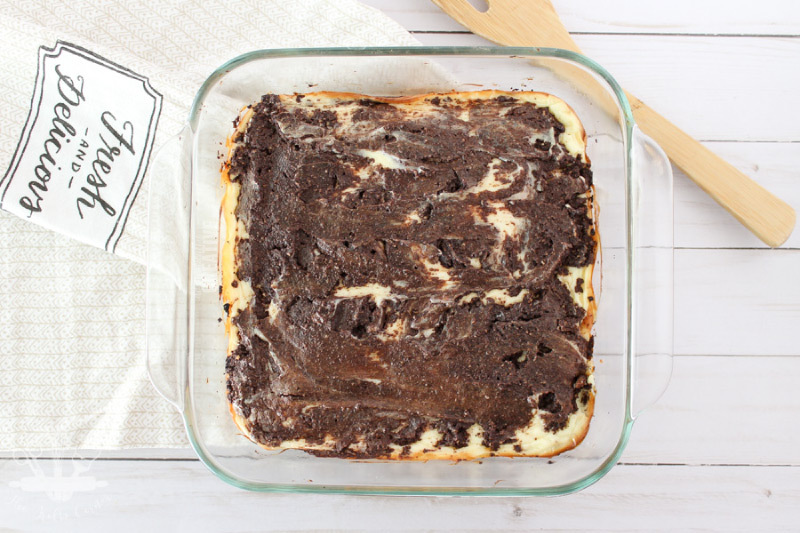 The batter for these keto cream cheese brownies will be thicker than you are used to with regular brownies. Almond flour cannot be substituted for the coconut flour in a 1:1 ratio. You would need probably 1 1/2 cups of almond flour to get the right consistency. Please note that I have NOT experimented with this ratio so I cannot guarantee the results. Also, the nutrition facts would be different so take that into consideration. While you can substitute Stevia for the Erythritol in this recipe, please note that it will not be a 1:1 ratio swap. Stevia is much more concentrated in sweetness, and can actually taste bitter in large quantities. I have not tested this recipe using granulated Stevia so I am unsure how it would change the batter consistency and taste or affect the final outcome. 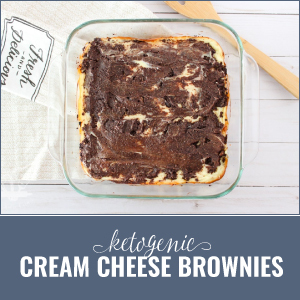 If you are looking for a great sugar free, low-carb alternative to traditional brownies, you've found it in these delicious keto cream cheese brownies., sugar free and keto friendly alternative to traditional cream cheese swirled brownies. Preheat oven to 350 and grease an 8x8 pan. Set aside. In a medium bowl, beat cream cheese until whipped. Mix in egg, vanilla and powdered erythritol until well combined. Set aside. In a large bowl, beat eggs until they are frothy. Stir in erythritol and mix well. In a small microwave safe bowl, melt butter and chocolate for 30 second intervals stirring between heatings, until chocolate is completely melted. Add vanilla, salt, baking powder and melted chocolate to the bowl with the eggs and stir well. Once mixed, spread 3/4 of the brownie mixture into the prepared pan. Spoon the cream cheese mixture on top and smooth it around. Do you have the nutrition facts for this ? Hi Madonna! When I made the recipe up in My Fitness Pal, this is what it gave me: Per serving (based on 9 brownies) 125 calories, 11g fat, 3g carbs, 2g fiber, 1g sugar. So these would be 1 net carb. 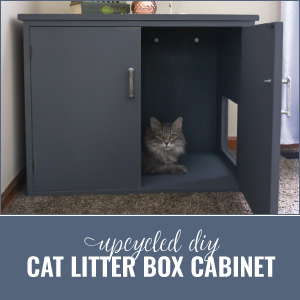 I’ve also updated the recipe to include it. Hope that helps! I think I might just have to make these tonight! Oh they look wonderful. Thank you Morgan! I hope you like them. Hi! Do these freeze well? Hi Erin! I haven’t actually tried freezing them, but would imagine they would be fine to freeze. Just took these out of the oven! Can’t wait to try, I used Lindt 90% dark instead of bakers chocolate. They look and smell amazing. I think your calorie count is off. 125 calories for 1/9th of the recipe is so low. Just the butter and cream cheese alone is 155 calories per serving . . . Thank you for pointing that out Stephanie! When I put in the ingredients in MyFitnessPal, the calories on the cream cheese was incorrect. There should be more like 210 calories per serving. I’ll update the post to reflect that. Hope you enjoy the brownies! This recipe is out of the park amazing! My go-to for my sweet tooth. Thank you!! Can I substitute almond flour for the coconut? I just don’t like coconut flour. Seems to overwhelm the recipe when I use it. I found these very salty and a bit ‘eggy’. So sorry you didn’t like the recipe Serena! Love these! I have made them 3 times now. I think it is important to make sure everything is whipped up very well. I also add a little heavy whipping cream to the brownie mixture to get it to spread…this is an excellent recipe! Thanks for sharing!! Thank you! I will try your heavy cream idea next time I make these. I am new to keto and this is my first sweet to attempt. I bought Lily’s chocolate chips that are sweetened with stevia, would that be okay? I sure hate to waste them because they were quite expensive. This just looks amazing and I want to try it right away!! Hi Chrysti! You could use those to make the melted chocolate, however, I have never personally used them so I do not know how they melt. I would suggest just using baker’s chocolate and saving the Lily’s chocolate chips for another dessert. Could you use the liquid stevia in the brownie portion as well? Thank you! I think you need the bulk of the erythritol to get the right consistency, but you could certainly try using the liquid stevia. Thank you! So glad you enjoyed them. Hi Keilla. 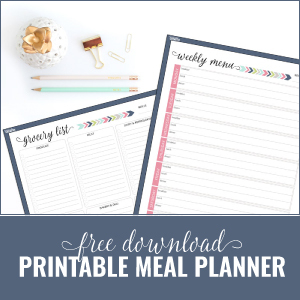 I also used My Fitness Pal to calculate the nutrition facts and double checked with the ingredients used to make sure MFP has the correct counts listed in their database. I would double check the ingredients you have input to be sure that MFP is not counting the wrong amount of carbs on an item. There is no way that a single brownie would have anywhere close to 17g of carbs. I tried these out yesterday, put powdered stevia instead of erythritol and cooked them for about 45 minutes. The brownie part turned out really bitter but the cream cheese part balanced the whole thing (kind of). Still, I would give my try of the recipe a 6/10 since i’m not throwing these out and could satisfy my craving of brownies. They look great, they just don’t taste that good. I’ll try to find a recipe that only uses Splenda next time. Sorry they didn’t turn out like you’d hoped Audrey! If you used 1/4cup of powdered stevia instead of erythritol, that may have caused the bitterness. Stevia is much sweeter than erythritol (and sugar), and if you use too much can often times come out as bitter tasting. You could also use Splenda in this recipe instead of the erythritol, but again it wouldn’t take the entire 1/4 cup as it’s sweeter than erythritol.